1-inch or more fresh ginger root, to make at least a tablespoon or more of ground ginger. **TIP** Freeze your fresh ginger in an air-tight container; not only is it easier to grate the ginger, but it keeps for a very long time. That way, you can take advantage of sales on Organic Ginger Root! 3 cloves finely chopped garlic, or 1 1/2 - 2 teaspoons dry minced garlic. 2. Combine the ginger, garlic, vinegar, and cayenne in a small cooking container. Bring this to a simmer, on a medium flame, for about 15 minutes or until there are about 4 tablespoons of liquid left. 3. Add the cranberry sauce, salt and pepper. Mix and bring to a simmer. Simmer on a gentle heat for approximately 10 minutes. Remove from heat and cool. Keep refrigerated. It will keep for several days, although you might just finish ALL of it after your very first taste! 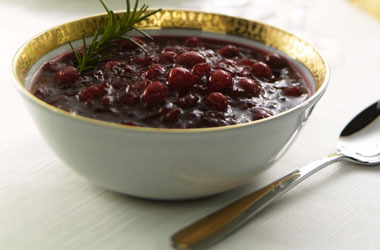 As much as i love old fashioned ''plain'' cranberry sauce & cranberry/orange relish, this one may just become my favorite! It's a perfect combination of sweet, savory, & hot. It was delicious on toast!